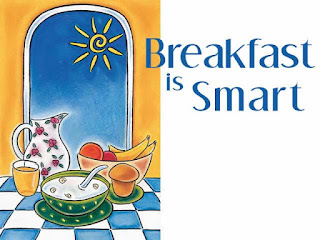 Consider all the times you remember being encouraged to eat breakfast — especially by the master-of-all-things-sensible: mom. With breaking news about nutrition available every day through the media, it may be difficult to believe that health professionals are still trying to help the public to master "the basics." Often overlooked, yet key to preventing many commonly seen health problems, are the commonsense principles upon which a healthy, balanced eating pattern rests. Enter breakfast. If asked, most people would acknowledge that eating something in the morning is a good idea. Yet, nearly one-fifth of adults don't eat at all in the morning. Many of those who do eat breakfast could stand to improve on their choices. According to Foodwatch, a Minnesota-based consulting firm that monitors food trends, the number of people eating "dessert for breakfast" — mainly refined carbohydrates — is on the rise. A classic excuse for skipping breakfast is often about dieting. People feel that by ignoring the first meal of the day, they are reducing their caloric intake and promoting weight loss. A vicious cycle is started to eat a larger meal toward the end of the day and actually not be hungry for breakfast the next morning. Our body loves to be fueled often to perform well.People, who claim they are cutting calories by skipping breakfast, also are the very same people who are found snacking later in the day and fighting the low energy battle in the late afternoon and evening. Breakfast was designed to rev up your body for the rest of the day by boosting your energy, keeping your eating patterns even and stimulating your body's metabolism. No wonder those who skip breakfast are constantly in the "focus on weight loss" mode. start the day simple or complex carbohydrates? Foods high in sugar, even the "natural" fruit sugar will raise blood sugar levels quickly and trigger hunger and sleepiness a few hours later. Your body still may be hungry from not getting enough fuel 24 hours ago and just responding to the feast or famine cycle of the day before. Carry a container filled with whole grain cereal to work and top with soy milk (in juice box container). Have 1 piece of any seasonal fruit. Combine low-fat or non-fat yogurt with fruit and cereal. Have low fat paneer paratha with mint chutney or curds. Blend fruit, milk and yogurt for a breakfast smoothie. Roll up a plain roti with scrambled Egg and tomato ketchup.